Perhaps the only people less worthy of receiving a bonus of any kind than the Moody's and S&P analysts who as recently as three weeks ago rated now bankrupt PG&E as investment grade is the management of PG&E, which one year after the most destructive fire in California history sparked, literally, another "most destructive fire in history" with no hedges or fallbacks in place. And yet as part of its first day bankruptcy motion, the California utility that filed for bankruptcy early on Tuesday is seeking to pay employees about $130 million in performance bonuses for last year, an amount which is due to be paid in March 2019. According to compensation and benefits court filing, the company - which is facing $51.7 billion in total debts - said that the bonuses "are critical to ensuring that employees stay motivated." 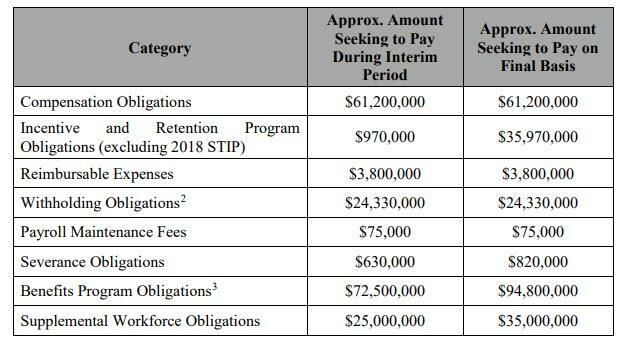 About 14,000 employees are eligible for short-term incentive plan cash awards for 2018, for achieving performance targets and individual goals. The payouts range from about $5,000 to $90,000 per person, not including senior officers and directors. PG&E also said it wants to maintain a rewards program that gives gift cards to workers who go "above and beyond" their regular duties, at a total cost of about $15.2 million a year; the company is also seeking to pay out $650,000 in outstanding awards. In separate filings, PG&E said it will keep paying $327 million annually for pension benefits. The decision to keep paying into its pension plan means about 54,000 current and former employees are unlikely to be drawn into the bankruptcy case, company says in court papers. The utility also pays $109.2 million annually in 401(k) matching funds for 22,000 current employees and $28.3 million annually toward retiree health care, and has asked the court to keep such payments. Also of note, the company’s $5.5 DIP loan (which was arranged by J.P.Morgan, Bank of America, Barclays, Citi, BNP Paribas, Credit Suisse, Goldman Sachs, MUFG Union Bank and Wells Fargo) doesn’t set any deadlines for PG&E to sell assets or adopt a detailed reorganization plan, which gives the utility far more freedom than most companies operating in Chapter 11. In fact, one can almost claim that the only limitation imposed upon PG&E is for litigants to seek relief for the tens of billions in legal fees that they will be entitled to as a result of the deadly California fires.